Social media didn't really exist en masse until the last decade, and there are so many fabulous perks for us vintage wearers with the rise of social media! 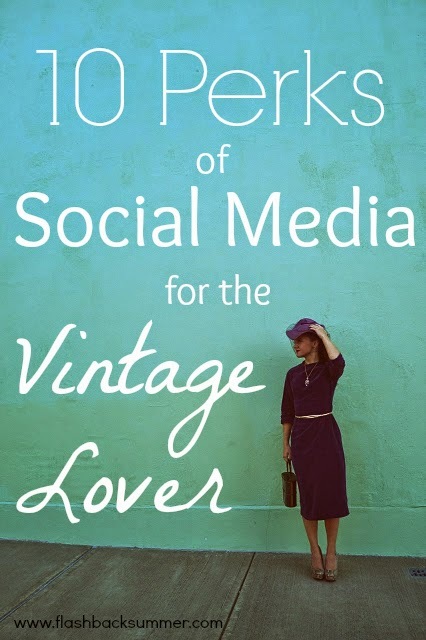 Below I've included 10 perks for vintage wearers in the social media world. 10. Keep up-to-date on deals and steals. Plenty of shops post sneak peaks, coupons, and updates on their social media accounts that they don't share on their blogs or in the shop proper. Following your favorite shops can keep you in the loop and in the know about great deals! 9. Get inspiration for your own looks. Instagram and Facebook are especially great for this. There are countless times when I've discovered a new way to style something or been given the extra ounce of courage needed to rock a style I've never tried from seeing someone else do it successfully! I. Love. Learning. And what better way to sift through all the World Wide Web for info you actually care about than to follow and like other vintage lovers? Then it's as if you have a team of like-minded people combing the interwebs for interesting tidbits 24/7, all brought to your fingertips! Lots of people post sewing successes, knitting fails, etc. on social media for their friends and followers to see and learn from. Oftentimes you can take out the trial and error part by letting a friend do it, and sooner or later there will be a time when you can return the favor! 6. You can have a team that has your back. All of us have things that we are looking to add to our wardrobes, collect, or just plain have an irrational addiction to. Social media friends and followers oftentimes become amazing teams of people that will let you know where to find the things you love. Joanna of Dividing Vintage Moments does this for me all the time! She runs across Middle East and Egyptian print items I would never find and lets me know about them. Jessica of Chronically Vintage, as well, was the one that let me know about the amazing Casbah print skirt I ended up buying and refashioning, a wardrobe piece that I cherish! 5. Social media gives you people to bounce your ideas off of. 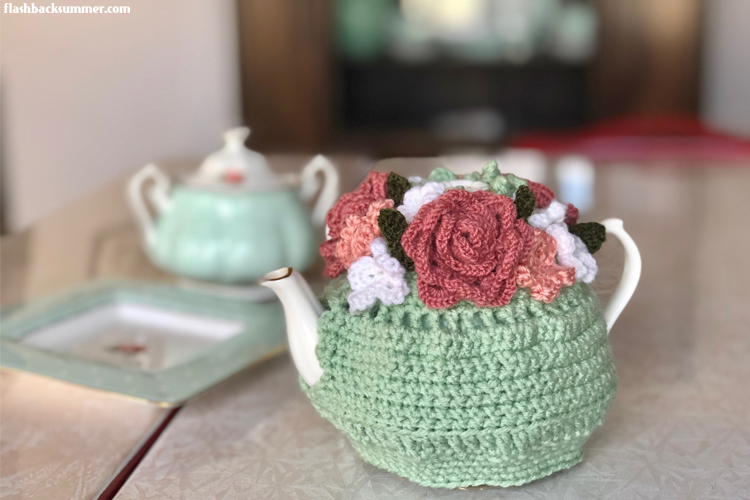 There are times when I have run into a dilemma, such as whether or not to refashion a wearable vintage pieces, and I asked the vintage community to give input via my blog, Twitter, and Facebook. Their input helped me decide what I would like to do and helped me make a more educated decision. The vintage community can help you when you're on the fence. Deciding whether or not to open a shop, start a certain kind of post series, whatever! 4. The vintage community can support you. 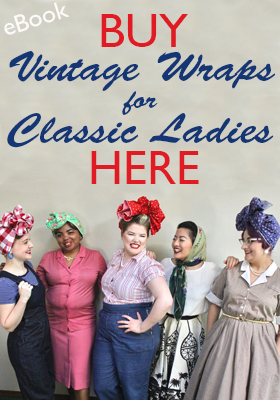 Whether you need emotional support in a tough time or support in starting a new business venture, the vintage community can help! For example, Wearing History has already raised over half of its Kickstarter campaign goal because of its connections with the vintage community that supports it. 3. Social media gives a new level of access to your favorite bloggers and vintage trendsetters. Unlike a blog post comment, social media like Twitter and Instagram can be immediately responded to and even turn into a conversation. Oftentimes it isn't as intimidating as emailing someone, and it isn't as easily overlooked as one blog comment among hundreds. 2. It breaks the facade of blogger/celebrity/authority perfection. Bloggers, magazine writers, and vintage "celebrities" are real people, but this is often glossed over in a blog. Social media lets the rest of the world see the more personal moments throughout their day via Twitter, Instagram, etc. Now we can see what their living room looks like in the morning light, or the epic knitting fail they did preparing for their next blog post. It brings the element of flawed humanity to people we all admire, and we love them all the more for it! 1. Get to know others in the vintage community better. 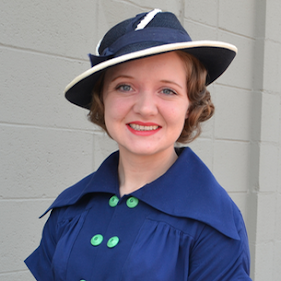 Not all of us have vintage friends in "real life," so connecting with other like-minded vintage fashionistas can be a really refreshing experience. (I'm telling my life right now.) However, these deeper relationships just can't be fostered through only reading each other's blog and Facebook posts. It's created through emails, comments, and--more often-- social media interactions! We can have conversations, send a picture of that building that made us think of that certain friend, or gush about the new fabric that just arrived in the mail from a swap. We can interact with each other at a deeper level and see little windows into our everyday lives! These are a few reasons why social media is so beneficial to us vintage wearers. For me, this is not just a list but a real discovery for my own life! I used to be anti-social media, feeling that being "plugged in" all the time would lessen my ability to fully enjoy "real life." While I still believe that is true to an extent and am sure to limit my social media use, I have also found social media to be revolutionary in making "vintage friends" that I would otherwise miss out on in real life. That being said, I would really love to connect with all you lovely readers and get to know you better. It would be fabulous to hear from all of you! Yes! All sorts of yes! Great post! And I agree with all of them! Joanna and Jessica are such dolls, and I too have experienced them looking out for me! AREN'T THEY?! Seriously, what a great dynamic duo to have on one's side! It's really true! I do love seeing everyone's interpretations of it. Hardly anyone is a catalogue replica, and we all put our own spin on it that fits our lives. It IS fun to see, and I'm glad you've enjoyed hearing about my journey as I've enjoyed hearing about yours! So true! I agree. That's why I put it as the last reason, because it's really the most impactful to me, too! Yes! It's so fun to get a peek into other bloggers' daily lives. It's really lovely that members of the vintage community look out for each others' personal collections, too. Trust me, if I see anything middle-east themed in my shopping I'll be sure to let you know! Well thank you so much, Frances!!! I hugely appreciate that! You let me know if there's anything specific you're on the lookout for, too! Stellar post, dear Em - this should be required reading for all new bloggers and a reminder for established ones alike. Thank you sweetly for including a mention of Chronically Vintage in it, I really appreciate that and will always continue to keep my eyes peeled for other Middle Eastern themed vintage items for you. I agree with everything you said here, this is a great post. I used to be quite anti social media but now I really enjoy using it and making connections with fellow vintage fans. This is a wonderful list, I am new to the vintage-loving on-line community and I am discovering that everything that you've wrote is very true. I'm so glad to be a part of a larger community.